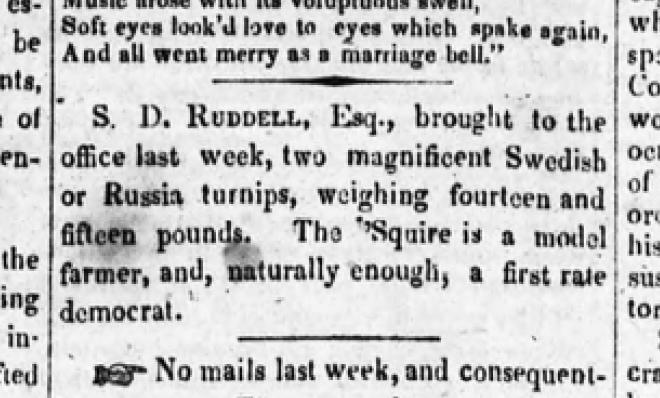 News item from the 1854 Washington Pioneer in Olympia. Local lawyer Ruddell with massive foreign turnips! Read all about it! The fake news that Abraham Lincoln filed a patent for a newspaper like Facebook in the 1840s is funny in the sense of how many people fell for it. Its also interesting in how its actually true in one sense. 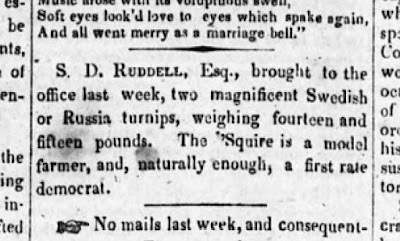 It wasn't so much Abraham Lincoln leading the charge, but Facebook was something that existed in the 1840s in newspaper form. There is a certain type of content that newspapers were full of through the early 20th century that today's papers ignore. What we look back on today as "social columns" cover the same territory that our social networks today do. I've had this blog post in me for awhile. In the late 90s, I worked at the Montesano Vidette. One of my weekly, late-deadline jobs was (including the police reports for Elma and McCleary) was sometimes to type up the "Satsop News." Through at least the 1970s, the Vidette ran columns from most of the small non-town communities in eastern Grays Harbor County. Satsop, Brady and a few other places each had their own "news" column written by a local. These columns would include typical social news. Someone came for a visit, someone went to Seattle. Lunch was had at Mrs. Smiths. By the time I was at the Vidette, the Satsop correspondent had moved five miles down the road to a mobile home park in Elma. The news came hand written on note pad paper. Sometimes a young relative of our correspondent would drop the news off and at least once I drove to Elma to pick up three hand written pages. I wish now I'd kept one original version as a keep sake, but at the time I resented having to edit the copy to a version that I thought was usable. I resent my own memory now of not leaving it be. I don't now how she came about the news from people who still lived in Satsop. Seeing briefly where she lived and how she seemed, I can't imagine she got around easily on her own. I imagine her calling a handful of friends each week, asking about what they and their families were up to. The similarity between her columns and the social columns from years ago that I come across from time to time when doing research is striking. Maybe its my memory conforming to my current thoughts. This sort of soft news, the sort of self-supplied social lubricant is something that newspapers have been walking away from for a long time. It seems to have been replaced with gossip-centric celebrity news. Facebook doesn't seem to be doing too bad though making it a central part of their business. It seems like that in the era since reporting and editing became professionalized and newspapers became corporate and seperated from their communities, they also forgot the vital role of the social column. Its not that the generation growing up on social networks is narcissistic. Sharing news of yourself and your own family and friends is not an act of narcissism. It is an act of a healthy social world and civic culture. It may not be interesting at all to people who don't know you, or your children. Posting pictures of your family out to dinner isn't at all striking to people who don't track your daily life. But, to your friends who know your middle child just got over a sore throat that kept you at wits end for a week, a dinner out is big news. And, big news is big business. It was to J.W. Wiley and A.M. Berry, who ran the Washington Pioneer in 1854. We aren't now no more narcissistic than S.D. Ruddell and his massive fifteen pound turnips. Another point to consider: newspapers in the west also served as a tool to promote immigration and settlement. Many newspapers sent copies east to libraries and to larger papers, hoping for reprints. Stories of oversize produce were one common subject, as well as long discussions of temperate weather and breathless reports of new industries about to be started by wealthy investors, implying demand for workers was high. Also, keep running across specious reports of nearby gold finds. I've seen one early W WA map that shows several working Gold Mines in the Black Hills, SW of Oly.